The legendary 1911 pistol is one of those things that creates urban myth, conjecture, and misconceptions among the firearms community. For many people, the 1911 pattern pistol is simply a wonderful gun that is fun to collect, great to shoot, excels in competition and has endless possibilities in terms of modifications and personalization. All of this is great, and I have guns that fall into all of the above categories. If you are a person interested in any of the aforementioned uses, the information in this article may not be what you are looking for. What we will be looking at here is the 1911 in true service use. That means everyday carry, high round counts, and continual training (shooting at least weekly). It is a gun that you are literally trusting with your life as well as the lives of others. Full-size, 5-inch, all steel 1911 service pistols are not the guns most people choose in this self-defense role. They are big, heavy, and require constant user attention. If you are not willing to make a substantial lifestyle investment, this is not the gun for you. Like a lot of people, I am very well served by a soulless, polymer-framed service pistol. With that said, I have gone through numerous 1911 phases in life, and like an old friend, I always come back to them with renewed enthusiasm. They bring a sense of confidence, and I will tell anyone that the 1911 .45 ACP pistol is the finest close-quarters gunfighting pistol ever made. However, since most people aren’t doing a lot of close-quarters gunfighting, and because of the other demands of the 1911 on the user, you might not think this is the gun for you. Despite its intricacies, the 1911 has a lot of redeeming qualities, and it would behoove any gun enthusiast to know a little something about them regardless of one’s intent to ever own or carry one. So, if you are still interested, and with that disclaimer out of the way, let’s take a look at three areas of note regarding the 1911 as a service pistol. This part is critical. This applies to every single pistol you are staking your life on. You need a 100% reliable, manufacturer-supported, serviceable pistol. There are many of these out there but in the case of the 1911, I have found that the choices are limited. Personally, my hard use service 1911s are almost exclusively Colts, simply because they meet the needed criteria of having factory-trained armorers available for police officers, factory-certified gunsmiths, and a high level of factory support. As a police officer involved in firearms training and in the firearms industry since college, I have handled tens of thousands of law enforcement service guns. None of them are immune to issues. Just because a company uses state of the art production techniques does not mean that a bad gun (or a bad batch of guns) can’t slip through from time to time. I have seen issue-pistols with unfinished parts, problems with some phase of the cycle of operation (usually extraction and ejection), magazines that are unreliable, and guns that would simply not go “bang” right out of the box. The best thing you can do with any service pistol, and particularly the 1911, is to have an experienced and well-trained armorer go through the gun prior to putting it into service. This gun is a great example of “what you need”. It is a dead stock Colt Wiley Clapp full-size Government Model. It has had a full inspection by a Colt factory LE Armorer, Chip McCormick magazines that have been function checked, and the original 1911-type safety replaced with a bar stock unit from MARS Armament by the same armorer who checked the gun. 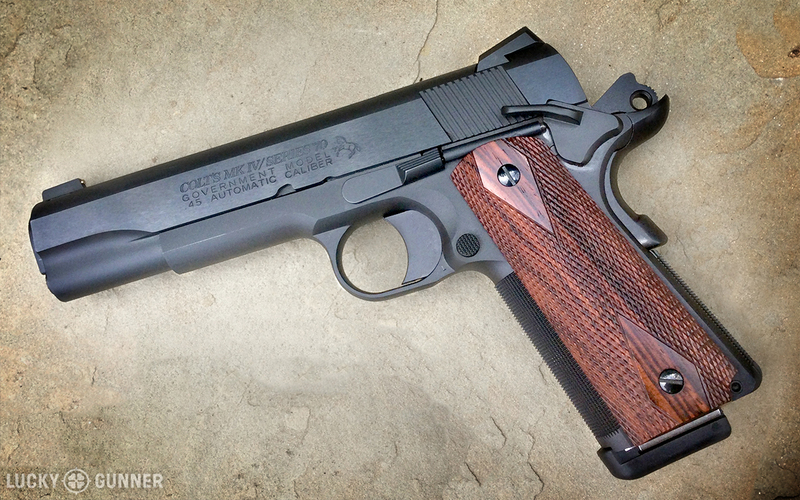 The factory slim grips were also replaced with standard-width Craig Spegel Cocobolo grips as they fit my hand better. A simple cleaning up of some of the internals is a good investment with most of the current popular modern service pistols. In the case of the 1911, things are a little more complicated. At minimum, a good $100 reliability package is a solid insurance policy from an established gunsmith or a good factory-trained armorer. Keep in mind that there is not a single true “drop-in part” in a 1911. While most armorer courses use a simple set of punches for required tools, the 1911 needs files. This is not a job for a hobby smith. It requires someone who knows their stuff and has the right tools. I recently had some time on a $4,000 high performance 1911 from a well-established firearms company. The gun was a work of art, shot well, and seemed to be reliable in a simple range test. However, when subjected to a more detailed examination and inspection by a skilled armorer, that pistol failed numerous function tests and protocols. Making sure your gun passes all function checks, ensuring all the parts are well fit, and determining that the gun is set up to run the performance ammunition you’ve chosen is critical, especially since the springs that work with your training ammunition may be way too light for some of the current +P performance loadings. Another “need” is to ensure your magazines all work reliably with your pistol. Over a long history with 1911 pistols, this is an area that has given me fits. I have had guns that simply “didn’t like” certain brands of magazines that worked flawlessly in other guns. I have seen more malfunctions and issues with 1911 pistols as a result of either bad magazines or magazines that don’t work with a particular gun. Unlike most of the newer service pistols, there are hundreds of magazine variants out there for the 1911, and they are not created equal or built to any sort of standard. When your magazines start having problems, trash them. They are disposable. Do not buy used magazines as they are often somebody else’s problems. Currently, most of my hard-use pistols are being run with Chip McCormick magazines that I test and rotate every six months. Do not be afraid to change to something else if you see that there is a reliability or longevity issue with what you are using. Just because it works in a friend’s gun or some super secret military unit uses them does not mean it will work in your gun. So, in short, if you decide to take on a 1911 as your primary everyday pistol, you need to have a professional ensure that it is properly set up and runs flawlessly with all of the magazines and ammunition you will use. One of the benefits to the 1911 is that a cottage industry has grown to the point that you can modify your gun in more ways than you can imagine. Some of these modifications are for improved ergonomics or based on personal taste, such as using the type of sights that work best for you. If the stock sights that come with your gun suffice, great. Sights are a personal choice and vary widely from person to person. The best sights for a person can also change with age, vision issues, experience or how the gun is being used. You should have a set of sights on your gun that allow you to efficiently pick them up quickly with your vision and use them in all lighting conditions. I like the sight picture of an all black “u-notched” rear with some type of front sight that has a small circular indicator. This would be something like a 10-8 Performance rear and a front sight with a tritium cylinder, brass or gold bead, or a fiber optic tube. It is what I see well, and it took me years to figure out. It has also changed with both experience and age. One of my best friends has had to go from using conventional sights to XS Big Dot Express sights on his high-end 1911. I was shocked when I saw this setup as it is fast but hard to work at distance. His exact words sum it up well, “I can’t hit shotgun hulls at 50 yards anymore, but I still outshoot all the kids.” He said that conventional sights are simply a blur and the XS sights are all he can see. The reality here is simple. Good sights, in combination with the exceptional fit of the 1911 to most shooters hands, and a trigger that is easy to press correctly under stress allow the 1911 to end fights quickly. 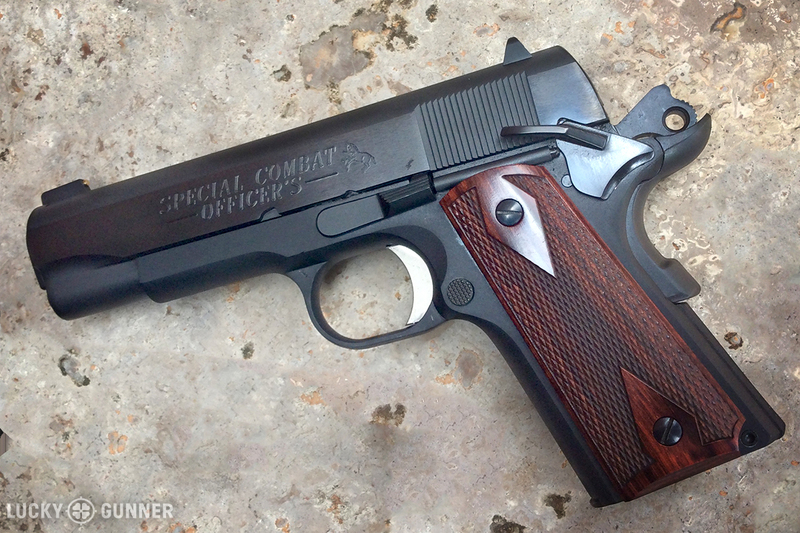 The Colt Special Combat Officer’s: This is an example of a 1911 with some basic “should have” modifications. This gun went to JT Timmons for some specific work. The stock Colt sights were replaced with Harrison Retro Sights rear. The front was dovetailed and a Wilson Combat gold bead front sight installed. It got an Ed Brown safety, the controls de-horned, an action job and a reliability package. Nothing real exotic, but the critical items were addressed by JT Timmons. You may also need to change or modify your grips to work with the type of safety that you have chosen. Grips should be efficient for the task at hand and allow for easy operation and manipulation of all the pistols controls. Conditions of use will dictate the texture of the grips. Select what works on a hard-use pistol, not what looks good. Save the ivories for your collector pieces and show-off pistols. Lastly, the trigger. Again, we all have different size hands and fingers. I like tailoring the triggers on my 1911’s so I can get my index finger set up for an efficient straight press to the rear. My favorite of the aftermarket triggers is a flat 10-8 trigger. Prior to these, I always liked a “long trigger” combined with a flat mainspring housing. If what came on the gun is a good fit, leave it. If not, it makes sense to modify it to try and get that critical link between the finger and the trigger as optimal as possible. At this point, if we have a very mechanically reliable pistol with its controls optimized for the individual who is carrying it, we are “there” on a solid duty/daily carry hard-use 1911. It should be noted that some companies like Colt and Springfield Armory have upgraded guns that are a few hundred dollars more than their base models with all the “should have” stuff on them. This can be big savings over buying a base model and having a well-qualified gunsmith do the work for you. Getting a solid grip on the pistol in all conditions is imperative to efficient shooting performance. I like texturing both to the front of the grip frame and the rear mainspring housing to allow for solid front and rear pressure to be applied. I have found over the years that this is a very personal thing. Often, old school checkering was hard on my hands when in multi-day training courses. I started using golf ball texturing done by Steve Morrison at MARS Armaments in 2005. This was ideal for me, and now I can use grip panels that are appropriately textured for the pistol’s use as needed (sharper for use with gloves, smoother for concealment). I have severe arthritis in my hands and have lost a lot of grip strength over the years. Having a pistol with a grip that fits my hand perfectly and is textured in a way to help me control it is a good investment for me. 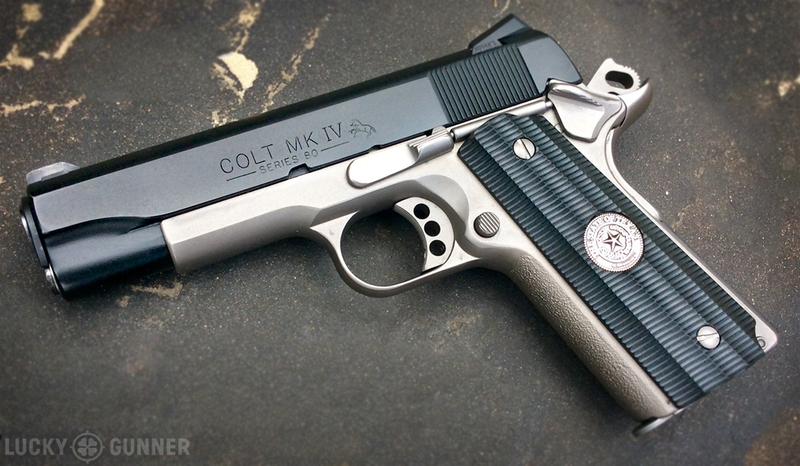 The Two-Tone Colt Government: This is one example of a “what we want” 1911. This gun was supposed to be my duty pistol when my agency allowed 1911’s. Unfortunately, I was forced to medically retire due to line-of-duty injuries before it was completed, and the police union took care of making it my retirement gift (far better than a clock). Steve Morrison from MARS Armament did everything I wanted for this one: the exact grip treatment, frame modified to get a higher grip, grip and frame safety to my exact wants. He did trigger work, action work, sights, and finish. This gun pulled yeoman’s duty working very high threat protection details after I retired and is a special one. Another area in “things we want” is the ability to have the pistol coated in a finish that helps with maintenance. I have guns that run the gamut from blueing to Parkerizing. Some are stainless steel. The finish of our pistol will often dictate the level of maintenance needed. 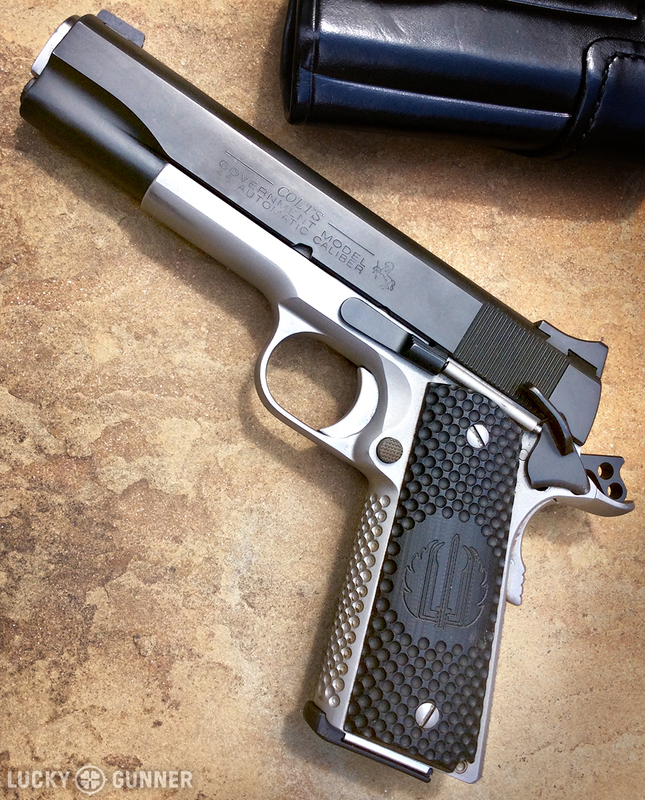 The 1911 is a gun that requires end users to stay on top of springs and lubrication. Anything we can do to lessen the load is a good thing. I have had great luck with Robar NP3 in the past. It allows the guns to function better due to its lubricity, and it is very corrosion resistant. The ability to clean the gun with a simple rag is also a nice bonus. Recently, I ventured into my first Cerakoted gun. While it has some good practical corrosion resistance properties over standard factory finishes, the reality is that being able to personalize the color scheme of your pistol is really just a pride of ownership benefit. My newest pistol actually had the Surefire X300 light that is Cerakoted in “Sniper Grey” to match the frame, while the slide and small parts are black. The two-tone look is a reflection of me having been in my prime in the 1980’s. Colored guns are far from the “need” and “should have” modifications, but it does give you some personal attachment to your pistol. Pride in your tools is simply a mindset thing. Having a pistol that has been personalized makes it feel “perfect” in my hand and because it looks the way I want it to look, I find myself handling the gun more and dry practicing more. All that dry practice is a critical part of any serious training program, and the more, the better. 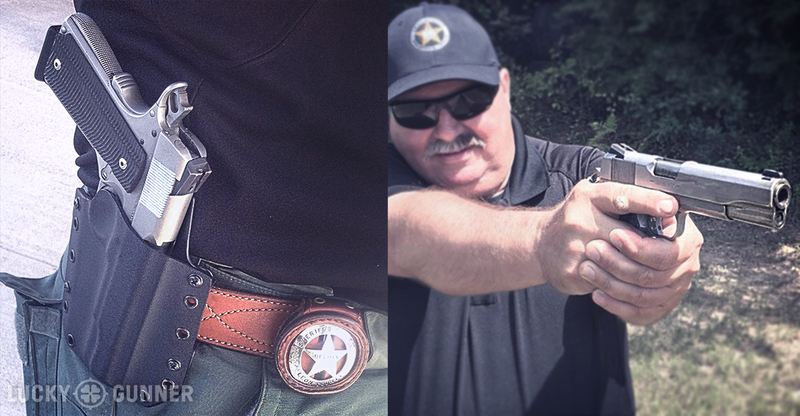 Victor Smith, a criminal investigator and SRT member from the Leon County Sheriff’s Office in Texas, shows what a hard-use duty 1911 looks like. It is carried daily in all his job assignments. He attends a lot of top-level training outside of his agency, and runs this gun like a machine. It is used hard and gets very high round counts, which is why the outstanding work done by Bill Thompson of Bill’s Custom Automatics, Inc is critical in keeping this gun running flawlessly. In the early 90’s, my first fully “bespoke” pistol was built for me by TJ’s Custom Gunworks. It was a pure concealment gun. A Lightweight Commander that was given the bar of soap feel by having all the sharp corners rounded and the frame was coated in the fairly slick Robar NP3 finish. To counter the slickness of the frame, a simple rough stippling was done to the front of the grip frame. This worked perfectly for its intended function. Again, fit the modifications to what you are using the pistol for and not mirroring what somebody else is doing. The modifications done to a pistol for use by a military unit tasked with overseas specialized combat operations will likely have different needs and requirements than a metropolitan police officer, an executive/VIP protective agent, an undercover narcotics officer, or a non-uniformed citizen carrying a concealed weapon daily. We don’t really have to do these types of “want” modifications, but it is these well-considered mods that can make that 1911 something very special and not just another gun we carry. Robar Two-tone NP3 Lightweight Commander. This is the first bespoke gun I ever had built. The work done by TJ from TJ’s Custom Gunworks is as good today as it was 25 years ago when he worked over every inch of this gun by hand. It was a total disaster when I bought it from my 2nd Field Training Officer, who was also a great friend and mentor, Pete Ambriz. When I got this gun back from TJ, Pete did not believe it was the same gun he sold me after years of being heavily abused and carried without a holster in Narcotics. It cost a bunch of money at the time, and it feels like a bargain today.